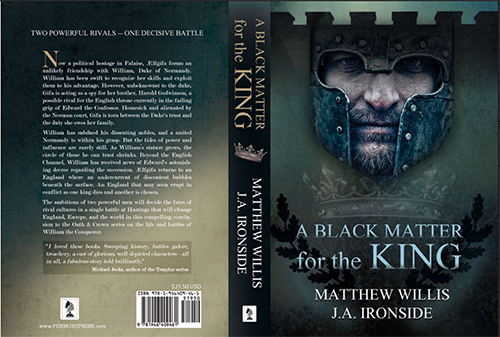 A virtual blog tour for A Black Matter for the King, the second of the Oath and Crown novels about the events leading to the Norman conquest of England, is currently underway courtesy of Historical Fiction Blog Tours. 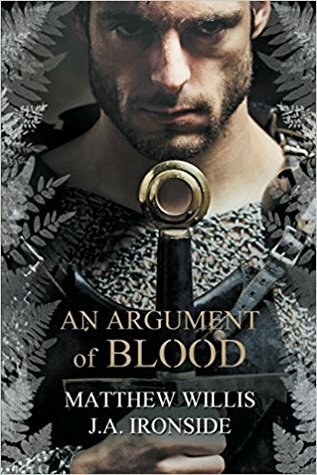 Please take a look at the blog tour page here to find reviews, features and a giveaway for a copy signed by authors Matthew Willis and J.A. Ironside. Oh my gosh, Friends. When I found out that this book was heading my way, I quite literally stalked the mail carrier. (You think I’m joking.) I had a rough idea of when the book should be arriving, and our mail carrier usually arrives around the same time every morning. So I made sure that my household chores and whatnot were completed before the mail was due to arrive, so that a) I could stare through my front door peephole all morning and b) I could read all day guilt-free (mostly) on the day it finally arrived. Which isn’t that odd in-and-of-itself…if it were only one day that I did this. I did it for five days in a row. A Black Matter for the King is the second book in the “Oath and Crown” series, and is…quite simply…an amazing bleeping novel. With as much as I adored the first book in the series (An Argument of Blood), I had high hopes for A Black Matter for the King. But not all sequels live up to their predecessors. Matthew Willis and J.A. Ironside, however, know what the heck they are doing and thus wrote an absolutely brilliant story. I loved every word, smiled at the humanness of the characters, sat on the edge of my seat as the plot thickened and found myself quite lost for a day or two after I turned the last page. Who needs movies with novels like this? ?